4Media FLV to MOV Converter is designed for you to convert YouTube or other FLV files to MOV formats so that you can enjoy FLV videos using Apple QuickTime on PC or Mac. 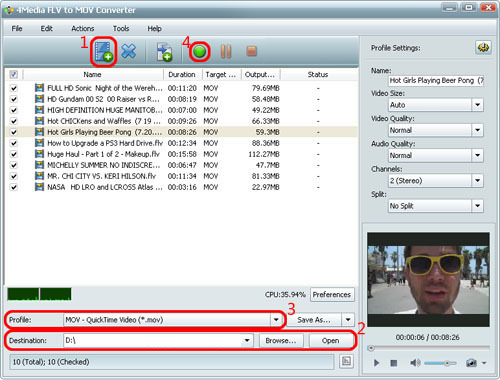 The following guide will show you how to convert FLV to MOV with this software step by step. Before you start, please download, install and launch 4Media FLV to MOV Converter. Click "Add File(s)" button on the toolbar or "File > Add File(s)" to load FLV files you want to convert. Or click "File > Add Folder" option to add all files in the folder you select. Click "Browse" button to set the destination folder for saving the output files. After conversion, you can click "Open" button beside "Destination" to view the output files directly. Click to open "Profile" drop-down list below the file list or in the "Target Profile" column, and choose the desired format from it. In the following we will show you the most frequently-used ways to adjust parameters. In the "Profile Settings" and "Advanced Profile Settings" panels, there're more parameters for you to adjust as below. In the "Profile Settings" panel, choose a split mode from the "Split" drop-down list or choose "Customize Size" or "Customize Time". The file will be split automatically during conversion. In the "Advanced Profile Settings" panel, enter the start time and duration of the wanted segment respectively in the "Start Time" and "Duration" textbox. The segment you specify will be converted automatically during conversion. 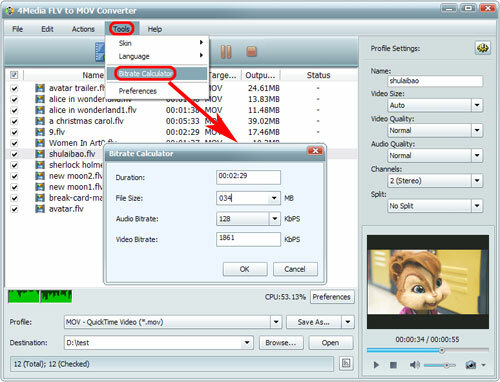 To customize the output file size, select the video file and click "Tools > Bitrate Calculator" option, then enter the size you want in the "File Size" textbox, and choose desired audio bit rate. The video bit rate will be calculated promptly. Click "OK", then the entered size will be displayed in the "Output Size" column of the file list, and the bit rate will be changed in the "Advanced Profile Settings" panel. If you want to output several files with different formats or settings from the same file at one time, this feature may help. 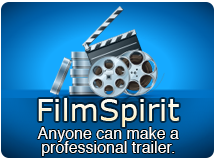 Highlight the video, and click "Add Profile" on the toolbar or "Edit > Add Profile" option to add a profile for the video, then change the default profile to the one you want and adjust its parameters. Repeat the process to add as many profiles as you want. 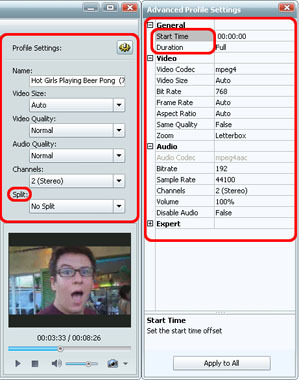 Then output several files from this video within one click. After the above settings, click the "Convert" button on the toolbar to start converting all the checked files in batches.